By default, one has to move mouse to the end of tab button and then click X sign to close specific opened tab. Modern web browsers like Google Chrome and Firefox also support closing of tab by middle button click (wheel press). Do you want to make closing of tabs routine in Firefox browser more easy and quick without having to waste time in moving mouse pointer from webpage to tab button for closing it? There is no need to move mouse pointer control from webpage to tab buttons at the top for closing tabs in Firefox browser. You can simple close tab from anywhere on the webpage opened in Firefox by configuring double click or triple click routines. 1. Launch Firefox browser and open Double click closes tab addon webpage. Once you install this addon, you can configure and select which click action should be used to close tabs in Firefox browser. 2. Click on Firefox button at top left and then click Addon option. Now click Options button next to “Double click closes tab” to open DCCT options pop-up box. From the drop down box at the top next to “when clicking inside pages”, select click action for closing tabs. You can select either of: double clicks, triple clicks, double middle clicks, double right clicks and triple right clicks. Once you configure this, you can close tabs from anywhere on webpages and there no need to reach for X button on tabs for closing them. 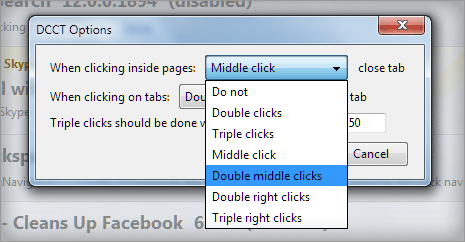 If you still prefer to click on tab button for closing, then you can configure different action “when clicking on tabs” by selecting either of: double clicks, middle clicks, double right clicks and triple right clicks. This small addon for sure makes closing Firefox tab routine quick and easy – what say?